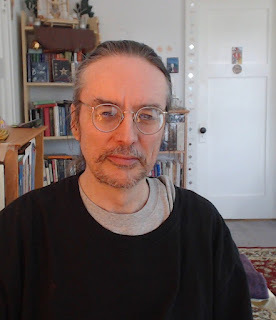 Check out the latest interview of me at Modern Mage Interview This is a really long interview, I think the transcript was over 30 pages and it gave me a chance to go into a lot of depth on many issues. In particular to discuss more fully the issue of worldview and the difference between the modern atheistic/materialist/nihilist worldview and the traditional worldview, which integrates the material and the spiritual, plus Fate and Free Will, modern and traditional astrology, Picatrix and astrological magic and more! Check it out! On February 28, 2017 we had a mass talisman ritual where people all over the world made their own Dream talismans. I was very pleased by having so many people respond to my offer on my Facebook and Spiritus Mundi discussion group. "And let there be made an image of dreams, which being put under the head of him that sleeps, makes him dream true dreams concerning any thing that he hath formerly deliberated of; and let the figure of that be the figure of a man sleeping in the bosome of an Angel, which thou shall make...in Libra ascending, Venus being received from Mercury in Gemini in the ninth house, by writting upon it the Angel of Venus." Three Books of Occult Philosophy, Bk II, ch. 50. While Agrippa talks about prophetic dreams, these talismans have also been used for lucid dreaming, that is dreams where you know you are dreaming. I think that lucid dreaming is a very useful spiritual practice and I discuss it further in my Hermetic Dreaming page. In particular I wanted to share two great responses I got back from people that made the Dream talisman. First, "I recently made the dream talisman that you recommended and have had great success with it for Lucid Dreaming which I have been trying to do for over a year." NH, Australia. Very cool! The next response was also quite incredible, "Hi! The dream talisman was AWESOME. Sunday night I dreamt that I was a woman in a white dress with hawk on my left arm...just walking, feeding the bird (I'm usually afraid of birds so that is interesting). Yesterday I walked out of my office to leave and look what was on my CAR!!!! I've NEVER had a hawk on my car before. SO CRAZYYYY!!!!!" JH Florida. 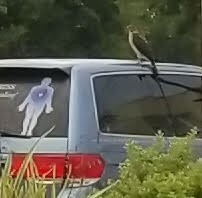 You can see the picture of the hawk on the car above to left. I'm definitely going to do more mass talisman making in future! Watch out for the free offers on my Facebook and Spiritus Mundi discussion group.